The kitchen. For most, this area is one of the best spots in the house. Besides the bedroom and bathroom, the kitchen is pretty important, as it’s the place where priceless moments are shared, families come together to cook, and guests hang out to catch up. Because this area has a lot of traffic coming and going on a regular basis, it’s natural to see it in slight disarray from time to time. Usually the things left out are needed to make a quick snack or meal on the run. Over time it becomes easier to just leave these things out for instant access. However, this can become a killjoy, as space is limited to maneuver about freely around the kitchen when needed. Luckily for you, we have a remedy for this. With these kitchen storage ideas, you’ll not only cut down on kitchen clutter, but you’ll be able to discover new ways to utilize parts of your kitchen that you never paid attention to before. We’re all familiar with the infamous pantry closet, right? It’s the place where are your favorite staples to cook with reside. It’s also the place where you can hide your goodies without them being in plain sight to those who have their eye on it. 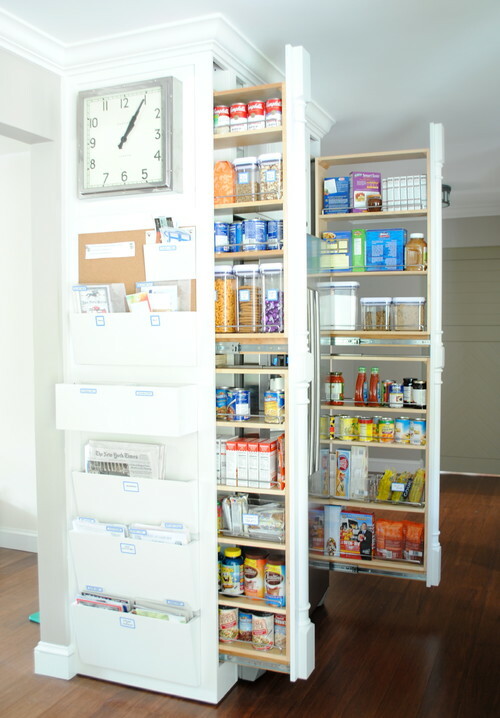 But what if you had a pantry that came a little more organized for you? This built-in pantry provides designated spaces for your bread and baking, as well as side storage for any additional herbs and spices. If you look up further, you’ll see that you can also store your favorite wines, too. What a great way to keep your favorite bottles out of harm’s way. If you have an odd-shaped kitchen and find that a normal pantry is just not conducive, you may be a worthy candidate for the innovative storage hub above. 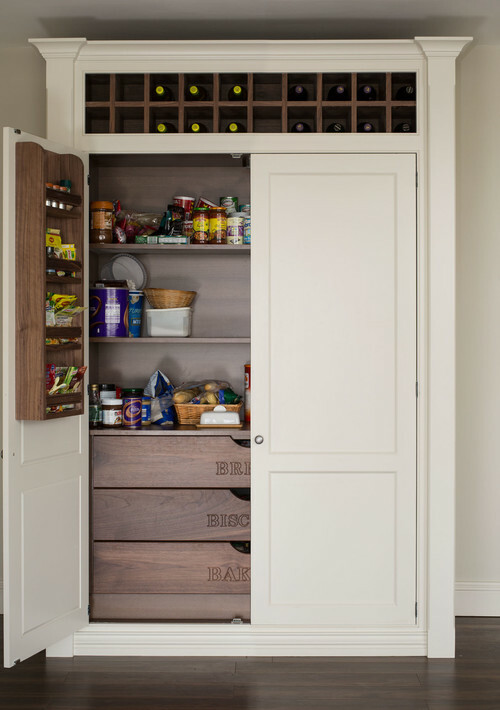 This sliding pantry is designed in a way to not only store away food, but to also keep car keys from getting lost, newspapers intact, and carryout menus handy. 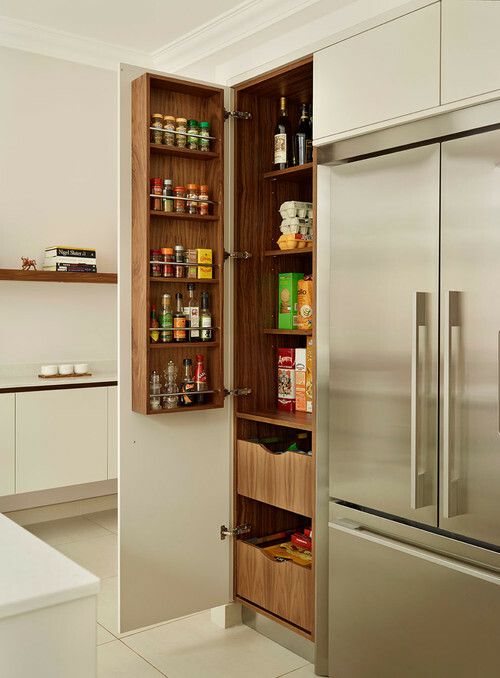 Another chic and discreet way to store kitchen favorites is to mount a walnut wood mini-cabinet in your small pantry so that you always have easy grabs to your top herbs and spices while creating a delicious meal. Now it’s time to get a little more edgy with kitchen storage. Let’s take it up a notch. If you never found a good use for corner drawers, you’ve just found its purpose. The diagonal design of these corner drawers are perfect for storing blenders, skillets, and other kitchen additions without taking up room on your counter. While they’re closed, no one would ever know that they opened up. Last but not least, who could resist multi-purpose essentials? 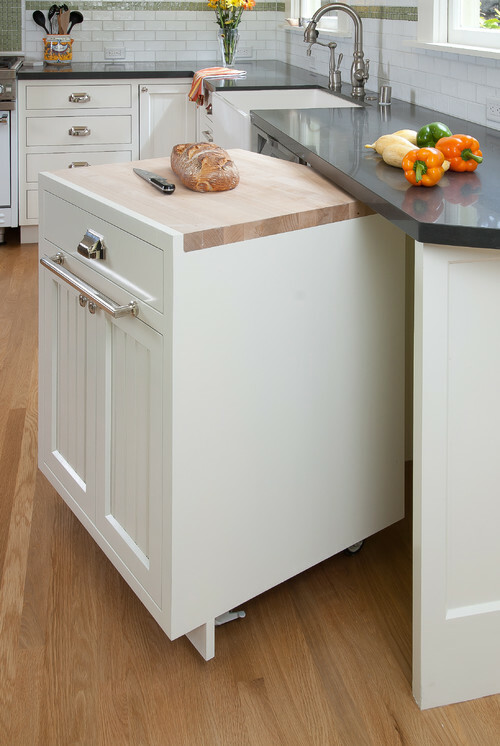 Not only could we all use more storage options in the kitchen, but we could also use some extra counter space at any given time as well. This rolling cabinet serves as a great way to store even more essentials while giving you more space to cook your meals fuss-free. With wheels made for motion, this rolling cabinet could also be rolled right into another room. You won’t ever have to miss your favorite show to cut your vegetables again! Don’t be surprised if you’re asked if you still cook. The kitchen storage options you have at your disposal now will make others wonder how you keep it all together! By Lynn Filkova from Adorable Home.